'SEASCAPES' An ocean lover's dream. Step into Seascapes and enjoy ocean views across the sound to Acadia National Park's Schoodic Peninsula. This shingle style home is a thoroughly modern take on the fine homes of grand and historic Grindstone Neck. This exquisitely designed, constructed, and maintained gem was built in 2006 by Mike Hewes, one of coastal Maine's finest builders. The home boasts 4,740 square feet of premier quality construction; 15 rooms; 5 bedrooms; 5.5 baths; 10-foot ceilings with period molding; custom built-ins; quarter-sawn oak floors; marble tile; marble, granite, and mahogany countertops; radiant heat; native granite fireplaces; high speed cable internet. Enjoy the custom designed cook's kitchen with Wolf, Sub-Zero, and Bosch appliances. Everything about this home is custom, including the butternut trim cut from the owners' maple sugar farm. Grounds are terraced with native granite quarried on site, sloping toward the shore. 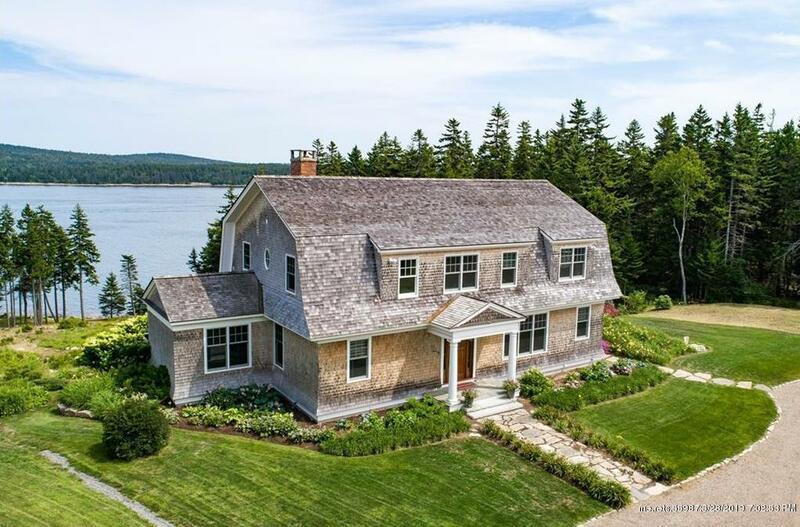 593 Grindstone Avenue (MLS #1353802) is a gambrel, shingle style single family home located in Winter Harbor, ME. This single family home is 4,740 sqft and on a lot of 122,839 sqft (or 2.82 acres) with 5 bedrooms, 6 baths and is 14 years old. This property was listed on 12/07/2018 and has been priced for sale at $2,200,000. Nearby zip codes are 04607, 04609, 04613, 04617 and 04669. This property neighbors other cities such as Bar Harbor, Brooksville and Gouldsboro. Listing Last updated 04/08/2019 5:45 PM CDT . Some properties which appear for sale on this web site may subsequently have sold or may no longer be available. Walk Score provided by Walk Score. Mapping data provided by Google and Bing.